Ussurian pear is an Asian pear. 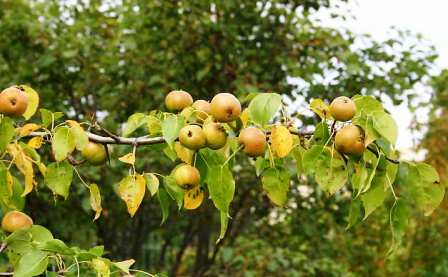 Since it is native to Ussuri River Valley of inner Manchuria in Northeast China, so it has been named Ussurian pear. The trees of this fruit mostly grow wild in village common lands. But at many places, this fruit is planted as a back yard tree. Ussurian pear has now also been taken to other parts of the world including United States. 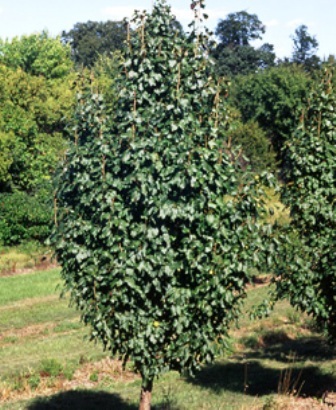 A medium deciduous tree growing upto 15 m; form variably rounded; buds with overlapping scales, blackish-brown; 3-6 mm. Leaves simple, ovate, setosely-serrate, smooth or nearly so, leathery; 5 to 10 cm long, 3 to 6 cm wide, semi-glossy, dark green, orange to yellow during winter. White flowers, semi-glossy foliage and dense. Flowers buds pinkish, flowers white, 8 mm wide, hermaphrodite, borne in umbel like racemes. Fruit round, greenish yellow, 6-8 cm in diameter. Fruits are hard but juicy and edible. These ripen during winter. Their taste improves and sweetness increases much after frost. The fruits are used for jams and jellies. Ussurian pear fruits have very good keeping quality. These are also dried to blackness and used through out the year in fruit compotes by local people. Ussurean pear is the hardiest of all pears. 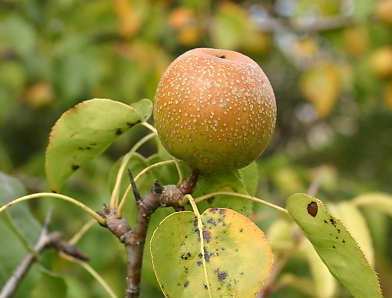 It can withstand a low temperature upto -15 C. This pear is the least susceptible to fireblight. It is a very good choice for colder climates. It is also a very ornamental tree. The trees prefer clay loam to sandy loam soils with a pH of 5.0 to 7.5. This fruit cannot tolerate salinity. There are a few named varieties too e.g. 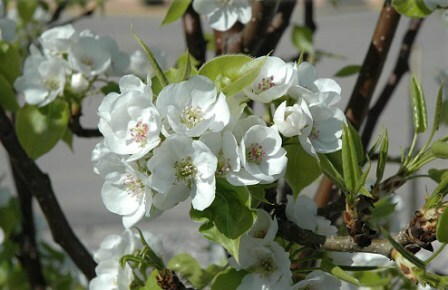 McDermand Pear, Prairie Gem® Flowering Pear. These are recommended for home planting by some extension agencies in USA.